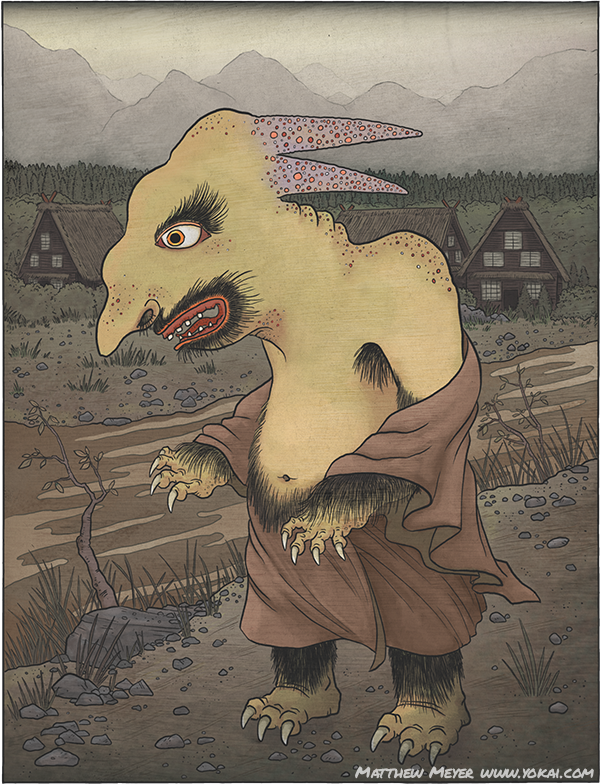 APPEARANCE: Nigawarai are large, ugly yōkai with horns and green-tinged, hairy bodies. They wear dirty rags. Their hairy mouths are twisted into what looks like a forced smile. Their hands end in sharp, poisonous claws, which are powerful enough to paralyze small animals. 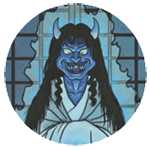 BEHAVIOR: Nigawarai are created out of the negative feelings of human beings—particularly, ill-humor and forced, feigned amusement. As their name suggests, they are related to the uncomfortable smiles that people make when trying to hide their feelings of discomfort. They cause ill-will, disgust and encourage arguments among those around them. They both feed off of and spread these negative feelings. INTERACTIONS: When used in cooking, the poison from a nigawarai’s claws makes food terribly bitter. However, it also has the ability to cure stomach pain, making nigawarai a useful yōkai for medicinal purposes. ORIGIN: The earliest references to nigawarai go back to the Muromachi period, where they appear in monster scrolls. These paintings appeared without description, so the original intent of the artists in describing this yōkai is unknown. Over the centuries, nigawarai continued to appear in other monster scrolls. Through the work of numerous artists, they eventually developed the traits that they are known for today.